My son is a co sleeper. He loves to have someone with him at night. I’m not going to debate if co sleeping is right or wrong today. 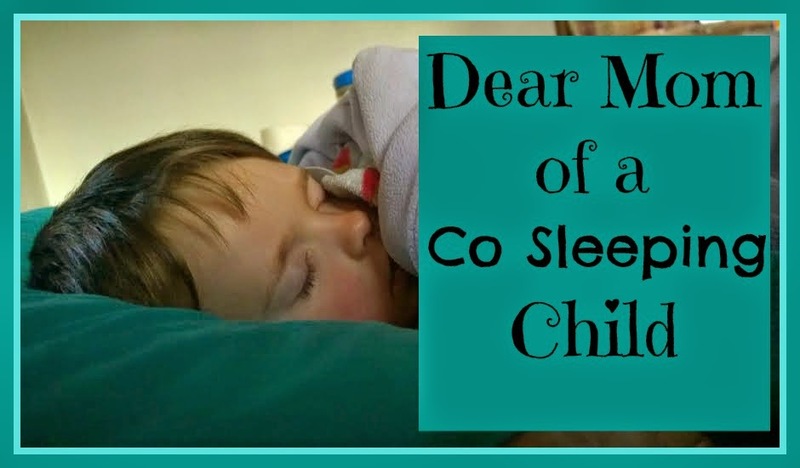 There is always going to be an argument going on around about co sleeping..... today though, I write to the Mamas who have a little munchkin co sleeping....I have been there...Hang in there...You're doing alright. Hang on. Kids need to feel safe. Shadows seem real in the dark. Cold dark nights of winter are 10 times longer when you are scared and alone. Multiply that times the active imagination of a preschooler or young child and they need you. My husband has been away for the last two weeks. I have let our four year old sleep in my bed during this time. We both feel safer being together. I know he is warm and safe because he is close to me. Last night he woke up several times and put his tiny arms around me. His tiny voice told me that he was scared. He was scared, with me there, imagine how scared he would have been alone. Hang on. My son always says “mom, when I fall asleep you have to stay with me.” I lay in his bed after we have done the reading thing, and wait for him to fall asleep. Sometimes I try to sneak out before he is really asleep and he cries. I tell him I am just going to the bathroom and I will be back to check on him. He usually falls asleep after that, but there have been times when he needed me to come back in there. My husband says I am coddling him, but I remember being alone and afraid of the dark. Hang on, using this time to build a strong sense of trust in your child will come in handy later when they remember you staying with them and they trust you. I know there are a million other things you could be doing. Dishes, switching the laundry, picking up toys, coats and shoes, packing lunches, checking backpacks, I know. Hang on. Hang on. You are one of the most important people in your child’s life. It is only natural for them to want to be with you. Even at night. Hang on. This is only a stage. Child hood is a series of stages, soon it will be over and you will miss it. Hang on. You are doing it right. Whether you fall asleep in their bed, or they fall asleep in yours. Weather you just stay in for the first 10 minutes or you stay in for the first hour. You are doing what is best for your child and that is important. Hang on. Hang on tight. Thank you so much for your post Erica! I love everything you shared! Don't forget to come back later for another post by me and check out my new videos on youtube this week! My Mom sent me this. Thank you for reaffirming what has always felt right to me but is often decried by others as something I should have immediately set to ending. I never have understood the need for parents to remove their child from being together at night. As an adult we don't typically choose to sleep alone and want our partner with us at night... why in the world would you want to force your child - the very being that means the most to you - to the side alone in the dark? It's never made sense to me. As a mom of 8 (former) co-sleepers, I say "here, here!" Co-sleeping has been wonderful for each of our children, in turn, until they transitioned out of our room and in with a sibling. Amazingly, they ALL sleep in their own rooms now ... even the 22 year old . No regrets! I am a Mom of 3 and my 2 daughters all slept/sleep peacefully in their own beds...but then my son came along. He was a very colicky baby and the only thing that would put him to sleep was holding him tight. Well my son is now 7 and every night he falls asleep in his bed and wakes up in ours. I have tried everything, but snuggling is what he likes and since he's my last baby I don't mind getting all the hugs from him at night ;) You only have little ones for a short time, why not treasure every moment!